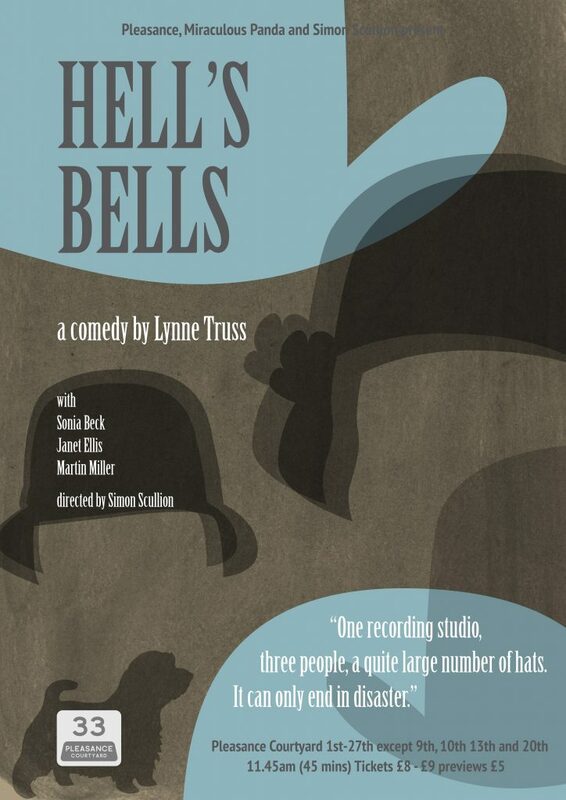 In the middle of August, I’ll be going up to Edinburgh to see my own play, Hell’s Bells, at the Pleasance Attic, and it’s going to be quite weird. A small, dark performance space will be focused, for less than an hour, on a few thousand words I’ve written, and on three characters I’ve made up. There will be a lot of hats on stage (because the play demands them). There will also (I hope) be an audience made up of real play¬-going people, none of whom I have met. I’ve been writing drama for nearly 20 years, but always for radio, never for the theatre. It’s not that I haven’t wanted to write for the stage. I have, in fact, yearned all my life to do so, but have weakly regarded it as somehow beyond what’s possible. Then, last year, the director/designer Simon Scullion asked if he could stage a ghost story of mine that had been on the radio, The Proceedings of that Night, and present it at Edinburgh. I did a bit of work on the script. He rehearsed with the actor Martin Miller. Thus it was that, one day last August, I found I had already started writing for the theatre, without even trying. The DVD in question is of an old costume drama called Mrs Milliner, which I based (affectionately) on The House of Eliott. In the play, the success of The House of Eliottis to blame for Mrs Milliner sinking without trace after one season. But something exciting has happened to Mrs Milliner now. One of the cast — the young actress who played Elsie, a cheerful 1920s cockney hat-maker — has become a global star, hence the demand for a DVD. When the time for recording arrives, however, there are only three people present: Phyllis, the vulnerable, beautiful star of Mrs Milliner (Janet Ellis); Carmen, its disaffected writer (Sonia Beck); and Simon, a young man who has just inexplicably arrived with a large delivery of hats (Martin Miller). Spotlight just on Phyllis and the two empty chairs; Phyllis bravely trying to keep it going, while behind her Carmen and Simon are fighting. While Hell’s Bells has been in rehearsals, I’ve been working on other stuff. When it opens, I’ll be covering the Olympics. But in mid-August, I will finally see it. For some, Edinburgh can be a launch pad to the stratosphere; for me, I’m thinking more of a message in a bottle. It’s on at 11.45am, so my main hope is that people will see it after having a mid-morning coffee and a big slab of cake. You might think this is peculiar, but in my experience, the warmest audiences are the ones full of jam and cream. A beautifully constructed 45-minute debacle .. Aptly, for the age of Downton Abbey, Truss has a joyful time with the cheesy absurdities of schlock period TV: Rafaella is nearly ruined when a hatpin sticks into the head of Lady Berwick, but carries on to support her piano-tuner father who was made unemployed in a chandelier accident. Truss is pitch-perfect on the awfulness and adds a third commentator in Simon (Martin Miller), a camp hat expert who interrupts the pair’s reminiscences with arias of praise about rick-rack, nectarine silk detail on a devoré velvet cloche, and the history of brim-stiffening technology. This creates tension because Carmen’s mantra is that, “It’s not about the hats! It’s about the choices that a woman has to make in a hard world!” Tensions build, flamboyant as the monstrous hats so lovingly described: hats with flamingos, tinkling campaniles, “witty knitted prawns”. In a magnificently staged brawl, be reassured that real hats do get harmed in this show. Fortunately the director, Simon Scullion, is a designer as well, and must be labouring long over the ostrich feathers after each show. Funny and knowing, Truss catches both the brittle affections of the stage and the disappointment of also-rans in a ruthless yet silly world. Sonia Beck is a bundle of comic energy as the bitter Carmen hiding behind a bluff veneer, matched by Janet Ellis who is unsettlingly convincing as the dippy yet complex Phyllis, the actress who wants to be everyone’s friend. Martin Miller brings doe-eyed affability with a hint of steel to the beset-upon Simon who valiantly fights to make his voice heard. Guaranteeing they deliver is Simon Scullion, whose skilful direction never once takes its finger off the comic pulse. Lynne – apostrophe alert – Truss’s choice for her first stage play neatly builds on her prior form in radio comedy drama, and she has the cut of her audience’s jib – despite the ill-chosen title. Stylewise she captures the cadences of each of her characters, including the instant switch into laid-back commentary that each makes for the microphones the moment the video rolls. It will be interesting to work out how to expand this one-acter, given that it is a rippingly spot-on production that deserves to tour and tour. Truss’s script is shrewd, droll, and delights in playing with language… A wonderful cast make this piece a joy to experience… Original, warm, and worth every minute.